The traditional cassata siciliana consists of round sponge cake moistened with fruit juices or liqueur and layered with ricotta cheese, candied peel, and a chocolate or vanilla filling similar to cannoli cream. It is covered with a shell of marzipan, pink and green pastel colored icing, and decorative designs. 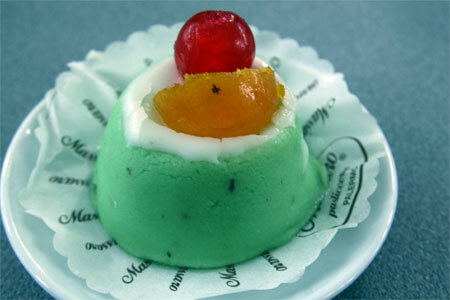 The cassata is finally topped with candied fruit depicting cherries and slices of citrus fruit characteristic of Sicily. The Cassatella di Sant’Agata —colloquially named Minni di Vergini, meaning “virgin breasts”—is a similar dessert, but made in a smaller, personal-serving size, with a candied cherry on top, and often a specifically green-coloured marzipan. It is typically made in Catania for the festival of Saint Agatha. The allusion to the female breast relates the specific torture Saint Agatha faced as a Catholic martyr. My family in Genova Italy has this every time I visit them! It is truly one of my favorite desserts and to this day I have not found a US version that I can tolerate! My Challenge To YOU: Find me the best cassata cake around- remember this is a seasonal dessert! I wish I could tell you one I liked. I’ve despised every cassata I’ve had. I’d be very curious to try the real deal. I know! I’m so disgusted by every one I’ve tried! I’ve tried numerous places in Little Italy and nothing hits the spot quite like the real deal ( then again- why would it?) I have a recipe at home for it that I’ll post next week!